I don't enjoy the actual act of moving (especially walking up and down stairs with heavy boxes), though I do like the way it forces me to declutter. Given my parents' job, moving every few years is pretty much par for the course for me. I've never consecutively lived in any country longer than the UK (six years this fall), but even here I've lived in five apartments in London and we're now in our second apartment in the countryside. T, unfortunately, is not very happy at the moment. For obvious reasons she doesn't remember moving to our current place two years ago, and though she's genuinely looking forward to Paris she's also a bit anxious and sad about leaving. We're pretty much tearing apart the world as she knows it. 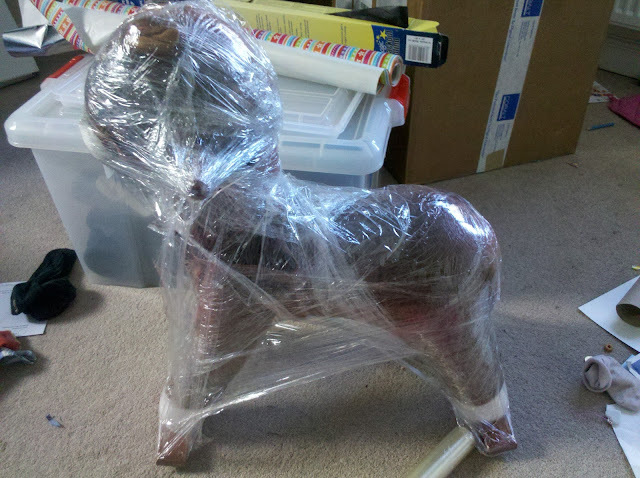 She's holding it together quite well, but when she saw Toby, her plush rocking horse, last Thursday (wrapped up for the storage container - since H will be living furnished, we won't need the bulk of our stuff till we come back), she sort of freaked. "Toby, what happened to Toby?" So I unwrapped him for the evening and rewrapped him the next day when the container came (T was at school). We've actually kept out almost all of T's toys, but she still asks me about Toby. So we make up stories about his adventures in the container, which makes T laugh. 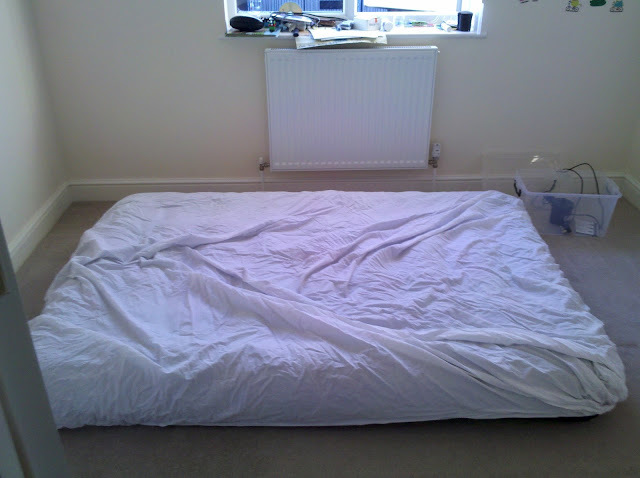 With our furniture in storage, H and I are currently sleeping on the inflatable mattress. T also misses having furniture around. 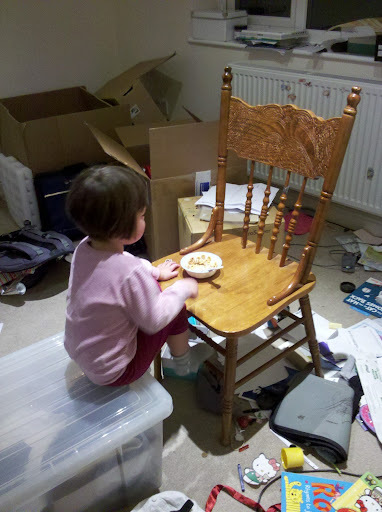 Though at least she has a table? H and I eat on the floor or standing up. The picture also shows how much there's left for us to sort out till the weekend. Which I guess I should be getting back to.